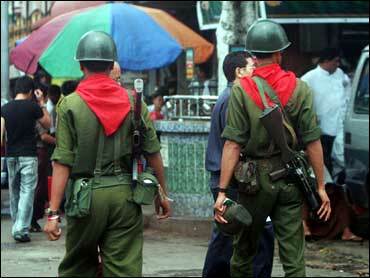 The U.N. Security Council said Thursday it "strongly deplores" the violent crackdown on protestors by Myanmar's military rulers and called for a "genuine dialogue" between the government and the pro-democracy opposition. A compromise statement approved by all 15 council members  including close Myanmar ally China  emphasized "the importance of the early release of all political prisoners and remaining detainees." The council statement was read at a formal meeting shortly after the United Nations announced that Secretary-General Ban Ki-moon is sending the U.N. envoy to Myanmar back to the region next week for consultations with key governments on international efforts to promote talks between the government and the opposition. The United States, Britain and France proposed a stronger text that would have condemned the violence and called for the immediate release of the political prisoners and detainees, singling out the pro-democracy leader Aung San Suu Kyi. But the text was watered down to get approval from China, which had proposed a much weaker text. In the statement, "the Security Council stresses the need for the government of Myanmar to create the necessary conditions for a genuine dialogue with Daw Aung Sann Suu Kyi and all concerned parties and ethnic groups in order to achieve an inclusive national reconciliation with the direct support of the United Nations." It welcomed the government's "public commitment to work with the United Nations and the appointment of a liaison officer" to Suu Kyi. "The Security Council stresses the importance that such commitments are followed by action," the statement said. "It acknowledges that the government of Myanmar has invited Mr. Gambari to Myanmar. It underscores its support for his return as early as possible, in order to facilitate concrete actions and tangible results."